It is no secret that regular exercise can have a positive effect on your health, most commonly for diabetes and obesity prevention. Yet, exercise can have wider ranging effects than just burning extra calories. It can boost endorphins, the brain chemicals that cause a happy mood, strengthen your heart and cardiovascular system, and even help prevent hormone controlled diseases. Studies have shown that exercise can have a protective effect for breast cancer, a hormone mediated tumor affecting many women. This lead researchers to wonder, could exercise have positive effects on other hormone mediated tumors, such as uterine fibroids? Fibroid development and growth in the uterus is regulated by estrogen and progesterone, the two hormones that regulate a woman’s menstrual cycle. This is why fibroids may stop growing during menopause, because the body is no longer producing large amounts of these hormones. Exercise has been shown to reduce the amount of these circulating hormones, which is why fibroid growth may be prevented by regular exercise(1). It has been shown that BMI (body mass index) is correlated with fibroids, so by reducing BMI through regular exercise women may be able to have an impact on fibroid growth. 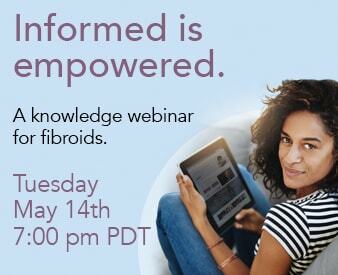 Fibroids remain the leading indication for hysterectomy in the US, and affect pre-menopasual and post-menopausal women alike. Yet, there remain few modifiable causes of fibroids, as their etiology remains largely unknown. Thus, by engaging in protective activities such as regularly exercising and maintaining a healthy weight, you may be able to reduce your chances of developing symptomatic fibroids. Fibroid Study Cited: DD Baird, DB Dunson, MC Hill, D Cousins and JM Schectman. Association of Physical Activity with Development of Uterine Leiomyoma. American Journal of Epidemiology. 2007; 165(2):157-63.